I graduated from the University of Alberta in 2009 with a BSc in Electrical Engineering (Biomedical Option). I then completed 3 years in the MD/PhD program at the University of Alberta before deciding that medicine was not the right path for me. After taking some time off to think about what direction I wanted to take with my studies and career I began a BSc in Kinesiology at the University of Alberta in the fall of 2015. During my time as an undergraduate student in Kinesiology I completed my practicum under the supervision of Dr. Albert Vette as well as a directed studies course. I completed my BSc in Kinesiology in December 2017 and I will be starting my MSc with Dr. Albert Vette in the fall of 2018. As part of my Kinesiology practicum in the summer of 2017, I worked on two research projects. For one project, I collected data for a study investigating the clinical validity of a wearable biomedical device for balance assessment in geriatric individuals at the Glenrose Rehabilitation Hospital. The primary investigator for this first project was Hossein Rouhani. The second project was part of a much larger project to develop a Performance Assessment Tool (PAT) for the Computer Assisted Rehabilitation ENvironment (CAREN) at the Glenrose Rehabilitation Hospital. Under the supervision of Albert Vette and Juan Forero, my task was to explore measurements the "Blocks" module of the PAT provides for patient assessment in comparison to traditional tests for single-leg balance. Then in the fall of 2017 I completed a directed studies course during which I continued to work on the PAT project. For the directed studies course I examined how gait patterns change in participants walking at a self-selected speed on the treadmill in the CAREN as they encounter various inclines. The objective was to investigate how much gait patterns during treadmill walking differ from normal gait patterns, and whether the use of a self-paced treadmill results in a more normal gait. 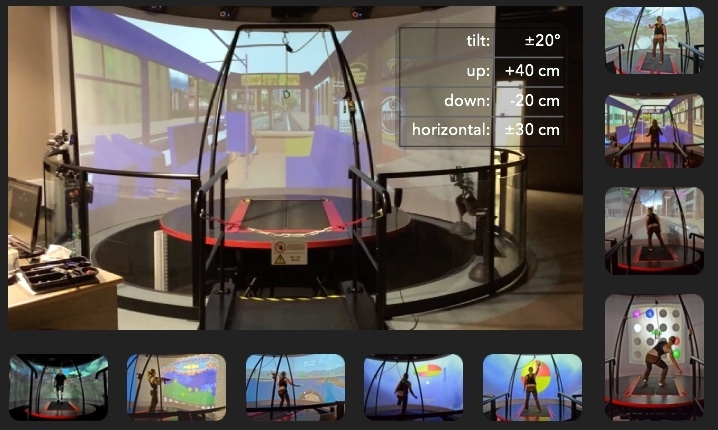 The balance assessment project I worked on during my practicum involved work with Physilog inertial sensors and MATLAB programming language for kinematic data analysis. For my work on the PAT project, both during my practicum and directed studies course, the CAREN system at the Glenrose Rehabilitation Hospital was used to collect data. For my practicum project, I used Microsoft Excel to analyze and present the data. For my directed studies project in the fall, I used MATLAB programming language for kinematic analysis.